This is the third post in Red Hat's three part series on open virtualization. Read the first post here and the second post here. As organizations optimize and modernize their primary datacenters, they also must plan for how the infrastructure at their remote sites will be optimized and modernized as well. Remote and branch offices, however, can have unique infrastructure challenges: applications at these remote sites need local compute and storage, space and power/cooling can be very constrained or limited and fewer (or no) technical staff are typically onsite, to name just a few. Modernizing these sites often exposes and intensifies these challenges, making more simplified infrastructures at these remote offices an important consideration to help ease budgetary and staffing burdens. Problems like these could benefit from a hyperconverged solution, a technology seeing increased use for remote and branch office deployments. 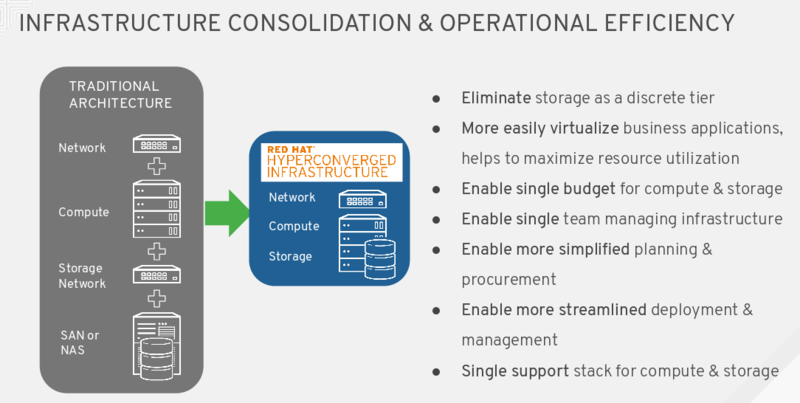 Hyperconvergence, where discrete software tiers can now delivered on a single server, can address many of the challenges introduced by remote sites through consolidating compute and storage, helping to simplify planning and procurement as well as management with a single solution from one vendor. The image below illustrates this consolidation as well as the benefits. Red Hat Virtualization has been shown to yield benefits of it own - a recent Forrester Total Economic Impact (TEI) Study commissioned by Red Hat highlights the benefits of Red Hat Virtualization. These benefits, when added to those of hyperconvergence as mentioned above, can make a compelling case! Built on Red Hat Virtualization and Red Hat Gluster Storage, Red Hat Hyperconverged Infrastructure is designed to provide more simplified planning and procurement, better streamlined deployment and management, and a single support stack for virtual compute and virtual storage resources. Red Hat Hyperconverged Infrastructure is designed to be an effective solution for remote/ branch-office or edge computing needs. Deployment is enabled by Ansible by Red Hat, and Red Hat CloudForms can be used to manage all the Red Hat Hyperconverged Infrastructure installations in your enterprise via a single application. Learn more about optimizing your IT with open virtualization and storage. Read a whitepaper sponsored by Red Hat about reducing the costs of proprietary virtualization. Watch webinars on moving to modern IT infrastructure and speeding virtualization deployments with Ansible.